Recently, during the music launch of Niaithale Inikkum at Satyam Cinemas in Chennai, music director Vijay Antony was elated to find superstar Kamal Hassan at the event. Asin starrer ‘The 19th Step’ In Trouble, Kamal Haasan Walks Out! The much-talked-about film 'The 19th Step' has come under the arc light for the wrong reason. It is learnt that Kamal Haasan has apparently pulled out of the project. The film also happens to be Asin Thottumkal's prestigious Indo-Japanese project. This will surely left Asin with lots of time that she has set aside to learn and practice the ancient art of Kalaripayattu. After the huge success of holding a global screenwriting workshop recently, celebrated actor-director Kamal Haasan is all set to produce, direct and act in some short films - based on the Tamil Nadu capital, Chennai. Chennai, June 20 : Actor Kamal Hassan has plans to produce, direct and act in 30 short films, which would be based on his hometown Chennai. "It would be about 30 short films about this city called Chennai. We will begin with Chennai, we will go to other cities as well. We are not making documentaries. It''s about the fictional world of writers as they look at Chennai," said Kamal Hassan, during a media briefing. Oscar winning French scriptwriter, Jean Claude Carriere, will guide some of these short films. Shruti Haasan multi-talented daughter of great actor Kamal Haasan, is presently very busy. Shruti is presently handling various projects which involve acting, singing and composing music. Shruti will make her debut through ‘Luck’, opposite Imran Khan, directed by Soham Shah. Shruti is also composing music for 'Unnaipol Oruvan' which is remake of Hindi movie A Wednesday. Kamal Haasan Can’t Vote This Year! At the time when the country's people are making use of their voting rights, Tollywood superstar Kamal Hassan will not be able to vote this year at Corporation School near Nageswaran Rao Park in Mylapore, Chennai as his name is missing from the voters list! 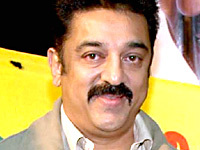 Despite his busy shooting schedule, Kamal was planning to fly to Chennai only to cast his vote. Nowadays, Kamal is in Hyderabad shooting for his upcoming flick 'Unnai Pol Oruvan'. But when the actor came to know about the exclusion of his name from the list, he feels really sad and frustrated. Bollywood is certainly not smiling on Kamal Hassan. With the release and failure of DASHAVATAR, the actor has now suffered his fourth straight flop in a row when it comes to his stint up North. Even though his most ambitious venture was a success when released in Tamil last year, the dubbed Hindi version has flopped miserably. It is reliably learnt that Venkatesh would involve in the shooting of 'Eenadu' with Kamal Hassan in the lead role. It is worth mentioning here that Kamal Hassan himself is producing the film, which is the remake of a successful Bollywood movie 'A Wednesday'. Hindi version of Kamal Haasan's Dashavataram finally released on Friday. Many famous Bollywood personalities were present at the special screening of the film arranged for family and friends. Kamal Haasan's companion Gouthumi, her daughter and actor's two daughters were also present at the special preview of the film. Dashavataram was a huge hit in south lets see if Hindi version of the movie also gets the same response. Mumbai, Apr 17 : Superstar Kamal Hassan is playing ten roles in his forthcoming Hindi dub of Tamil flick ''Dasavathaaram''. Besides acting in the film, Kamal also wrote the story, screenplay and the dialogues. With an ambitious storyline featuring tenaracters, ''Dasavatharam'' has contemporary messages encompassing concerns about the environment, science and faith. Atul, Hindi writer of the film, said that the film cuts across the time and space. Kamal Haasan’s much awaited Hindi version of his Tamil blockbuster Dasavtharam is finally releasing after almost a year since the original released. This mega budget extravaganza now titled Dashavatar is directed by KS Ravikumar has Kamal Haasan playing ten different characters, which by itself is a record of sorts. Ghajini girl Asin Thottumkal is in a double role and Mallika Sherawat also plays a significant part in the film. Akshay Kumar’s next release, Kambakkht Ishq is the remake of a Tamil film starring Kamal Haasan titled, Pammal K. Sambandam (2002). The Tamil film was a big hit down South. Shooting of Kamal Hassan starrer Unnai Pol Oruvan has started and the film is now expected to finish rolling and hit the theatres in July. The flick is being produced bilingually in Tamil and Telugu by the collaboration of UTV and Kamal Hassan. The superstar’s talented daughter Shruti Hassan scores background music for the movie. The flick is a remake of Bollywood blockbuster A Wednerday which also won the Stardust Award recently. The title of Kamal Hassan's upcoming flick Thalaivan Irukiran has been changed to Unnai Pol Oruvan. The earlier title was about a protagonist fighting while the recent one is something close to everyone's heart and one can identity with it. The film has already hit the floors and the shooting is going on in Hyderabad involving Kamal Hassan and Venkatesh. The flick is being produced bilingually in Tamil and Telugu by the collabartion of UTV and Kamal Hassan. The superstar's talented daughter Shruti Hassan scores background music for the movie. Finally, shooting for Kamal Haasan’s next movie has started at Ramoji Rao Film City, Hyderabad. However, the title of the film has changed to ‘Unnaipol Oruvan’ from ‘Thalaivan Irukkiraan’. The film will be bilingual in Tamil and Telugu. Unnaipol Oruvan is a remake of Neeraj Pandey’s directed critically acclaimed Hindi small budget film ‘A Wednesday’. Chakri Toleti is directing the movie. Raajkamal International and U TV Motion Pictures will produce the film jointly. Sharing the stage with his guru, Dr. M. Balamuralikrishna, at the music launch function of Pasanga, Kamal Hassan encouraged the filmmakers to make more films based on children issues like Pasanga. He also asked the producers and media to be more forthcoming in producing and promoting children's films that depict issues facing them. Nothing seems to be going right for Kamal Haasan after Dasavatharam. Kamal Haasan announced his ambitious project ‘Marmayogi’ but is has been shelved for reasons unknown. Kamal Haasan then announced the remake of the hit Hindi film ‘A Wednesday’. The film is being planned to be remade in Tamil and Telugu simultaneously. But Kamal faced some legal problems as Koneru Kiran Kumar claimed that he has obtained the rights to remake the film in Telugu form UTV. Now UTV is in trouble as Friday Film works, the producers of the original are now dragging UTV to court over breach of agreement. Veteran South Indian actor-filmmaker Kamal Haasan had insisted the politicians of Tamil Nadu and Karnataka not to mix art with politics. Kamal was speaking in the Platinum Jubilee Celebrations of Kannada Film Industry that was held on Sunday evening in Bangalore. The smashing success of Neeraj Pandey’s ‘A Wednesday’ -- starring Naseeruddin Shah and Anupam Kher in leading roles -- has motivated veteran South Indian actor-filmmaker Kamal Haasan to remake it in two languages. Kamal has confirmed that he would soon come up with the remake of the last year’s Hindi blockbuster in Tamil and Telugu. Kamal would be playing the role that Naseeruddin Shah portrayed in the original. In the bilingual film, Anupam Kher's character would be enacted by Malayalam superstar Mohanlal. Urging his fans to refrain from celebrating his birthday on November 7, as he was "deeply hurt by the killing of Tamils in Sri Lanka", Kamal Haasan asked them to 'redirect' their energy and enthusiasm towards human compassion. The South superstar said that he would feel proud if his birthday can be used as a tiny fulcrum to leverage public opinion against the genocide. Expressing solidarity with the Tamils in Sri Lanka, Kamal said: "Many are dying for a reason so unbelievably simple. They speak the same language - Tamil - as I do."